Our home theater systems have become much more advanced over the years. While we once consumed all of our media from a standard DVD player, or even an upscaling DVD player if we were lucky, we now have more sources than ever to play back media from. We’ve got standard Blu-Ray players, and 4K Blu-Ray players. We can stream from our laptop or desktop PCs. We can also use a Chromecast, or one of those streaming sticks. There are now more choices than ever to get our media fix, but there is one little problem – how do we plug in all of our devices? The solution is an HDMI switch. Typical switches or “switchers” are used in a corporate setting. You can have multiple inputs, and they need to be switched manually from buttons located on top of the switch. But a new breed of consumer grade switches are hitting the market, arming consumers with infrared remote controls that let them change the input from the palm of their hand. Today, we’re going to take a look at the three best switches on the market. We’ll go in-depth and find out what features separate them from the pack. Then, we’ll help you find the model that best suits your needs for 2018-2019. There are very few companies with as many multimedia accessories on the online market as Zettaguard. With everything from surge protectors to game controllers to Bluetooth speakers, they’ve got a large variety of solutions that can meet a large variety of needs. With accessories that can be used with almost every source on the market, it only makes sense that they would design an HDMI switch that makes it easy to change from one input to another. 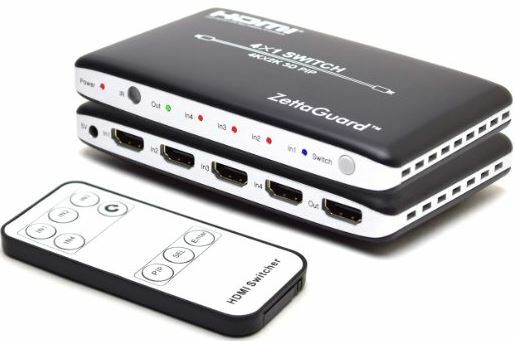 The Zettaguard HDMI Switch is attractively designed to fit into a unit which is both compact and easy to use. It has a small silver and black set top box. The back unit contains all of the inputs and outputs, while the front contains all of the indicator lights and the IR sensor. The nice thing about the indicators is that they tell you with just a quick glance which components are in use. The five LED lights on the face are capable of displaying two colors each – red and green for the output, or red and blue for the input. The output will be illuminated red if there is an output device connected, but not in use. If the output is currently on, it will turn green. To the right of this light you’ll find four indicators. Like the output, these input lights will illuminate red to show that something is connected, and turn blue to show you which input is active. It doesn’t matter whether these inputs are actively producing a signal or not. As long as there is power connected and one of the inputs is selected, the blue light will be illuminated. 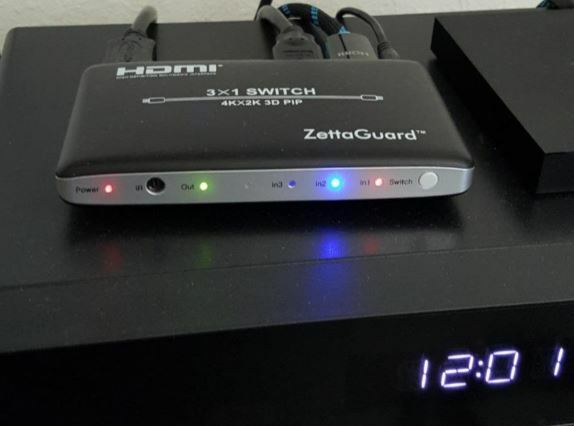 There are a few great features that make the Zettaguard HDMI Switch a lot easier to use than the one or two inputs built into your TV. For starters, the PIP (picture in picture) feature makes balancing multiple sources a dream. You can have, at all times, one input occupying your full screen, while another occupies a small portion of your display in the bottom right corner. You can actually have all four inputs active at the same time if you like. Three small inputs on the right, and one main one. This is great to have if you’re watching the game, but want to channel surf during the commercial breaks. Zettaguard gives you multiple avenues to control their HDMI switch, making it easy to change from one input to another. The simplest method is to use the four buttons located along the top of the remote control. They’re each labelled input one to four, so it’s pretty clear which button does what. Alternately, you can also use the “input” button on the face of the switch. A single press will cycle the input to the next one the list. If you’re not sure which you’d like to use, the “SEL” button will cycle through the inputs, giving you a nice visual display of what is showing on each one. When used in conjunction with the PIP button, you’ll be able to instead choose which input will be used for the compact displays. 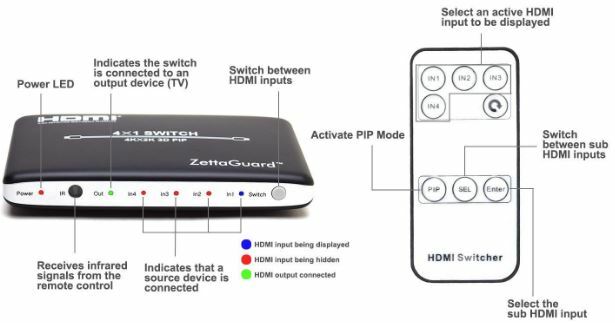 The Zettaguard HDMI Switch is capable of providing 4K output, something that is particularly useful when taking advantage of the PIP feature. However, it does only support 2K input (1080p). Provided you have a 3D capable display, you can use the HDMI 1.4 compatible inputs to enjoy both active and passive 3D content. Unfortunately, this switch doesn’t currently support 4K inputs at this time. Kinivo has had this switch on the market for quite some time, making it one of the top selling models on the market. They’ve been making multimedia accessories for many years, proving themselves as a manufacturer that focuses on durability and reliability, making them the first choice for many consumers. 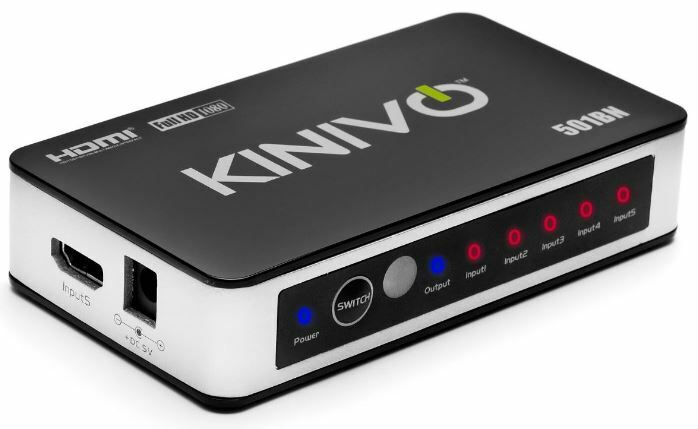 The Kinivo 501BN HDMI Switch is a little more ‘appliance’ looking than some, although it’s small design allows it to blend in with any home theater component. It’s the kind of device that you can tuck away behind all of your devices, allowing it to double as a cable management accessory so the rats-nest that tends to accumulate behind our displays is hidden from the public eye. This particular model has a total of five inputs, with four located on the back and a fifth on the side, next to the 5V power input. The device itself is very solidly made. The core of it is machined from a solid piece of aluminum, allowing it to hold up very well to any abuse it might encounter during day to day use. The plastic top is attractively decorated with the Kinivo logo, making it stand out from the crowd. One of the nicest features we found in the Kinivo 501BN is its ability to automatically switch inputs based on the active device. Let’s say that you’re playing Xbox, but you want to switch over watch some television. All you have to do is turn the Xbox off, and your cable box on. The switch will detect that your current input is no longer active, and change to the next active input on the list. Of all the models we’re looking at today, this one is the simplest to control. The automatic switching we mentioned above will cover almost all usage scenarios, but there are a few spots that it can hit a snag. For example, many cable boxes are designed to be left on at all times. In this case, every time you turn something off the switch will automatically default to that input. The solution is to use the included remote. Just a single press of the button will quickly allow you to cycle through inputs, tuning in on the one you need quickly and efficiently. If you’re the type that loses the remote (we’re always guilty of this) you can use the button on the front of the switch to perform the same action. The Kinivo 501BN is compatible with HDCP 1.2, with the extended ability to support deep 32-bit color. This means that although your HDR 4k content might be downscaled to 1080p, you’ll still be able to enjoy the rich color that’s available on the newest media and even some modern HD Blu-Rays. This switch does support upscaling form lower resolutions, giving you a crystal-clear picture with 1080i, 720p, and 480p video feeds. 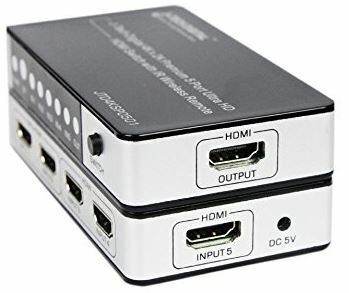 It’s compatible with any HDMI or MHL input, so you can easily connect it to your game consoles, media hubs, or any other device you would like to use. J-Tech is a company that produces the same high quality merchandise as its competitors, but focuses on making the newest technologies available at rock bottom prices. Generally, we’re recommend these types of devices to somebody who’s looking to save a few dollars. Impressively, the J-Tech switch has a couple key features that we haven’t seen on other switches, making it the first choice for certain applications. 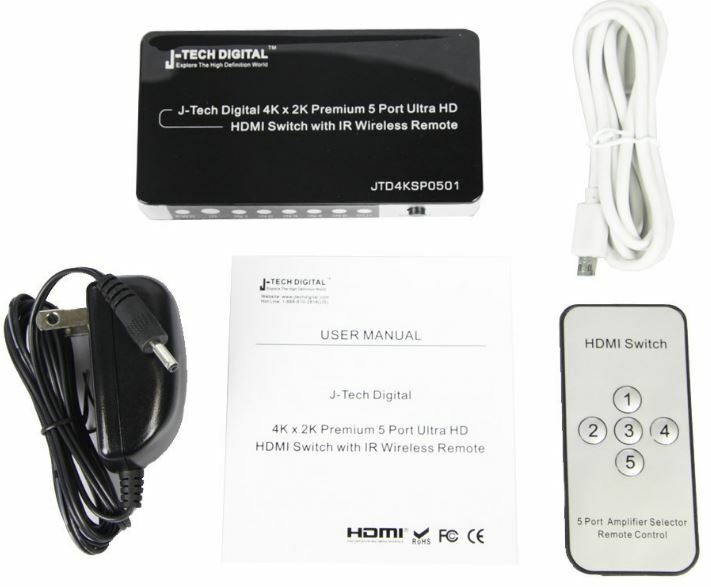 The J-Tech Digital HDMI Switch was designed with function taking precedence over form. Most of the face is taken up by the large strip of indicating lights that show you which input is currently active. The sides of the unit are plastic on this model, but it’s still rigidly designed so you’re unlikely to have any durability issues. With five inputs and one output, this might seem like your typical switch at first. But once you read the labels, you’ll notice something unexpected. 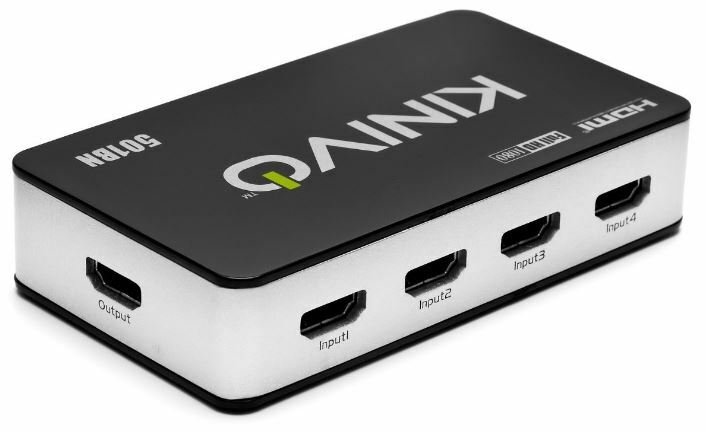 It’s got two ports that support both MHL and HDMI, and three that support only HDMI. So what exactly is MHL? This technology is used to connect your mobile phone or tablet to the converter. A simple $12 adapter lets you stream movies and media off of any Android or IOS compatible device, something that many consumers enjoy. But MHL is also used on devices like Google’s Chromecast, and is necessary when you’re casting from these devices. The technology is also used by affordable Android media boxes. This HDMI switch can be controlled in three different ways. You can use the included remote, a simple device that gives you six different buttons. The first five will switch you directly to one of the 5 inputs. The sixth button will revert back to the last input you had active, making it great for flipping between the game and the news. You can also use the button on the front, which allows you to cycle through each input. Finally, the switch can be programmed to work with any standard remote, so you can use your existing remote to operate it without adding to the growing pile of remotes in your media drawer. With the newer HDCP 1.4 protocol, this switch supports many of the latest standards. You can connect 4K inputs, although they will be downscaled to 1080p. It supports pass-through playback of all audio encoding including Dolby DTS-HD, PCM 7.1 surround, and many more. As we mentioned, it has MHL support in additional to HDMI, making this the perfect choice for any 1080p home theater system. 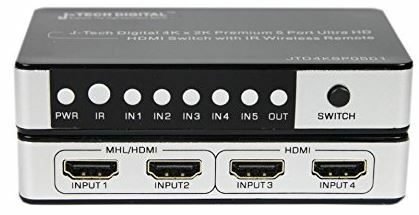 Which HDMI Switch is Right for Me? 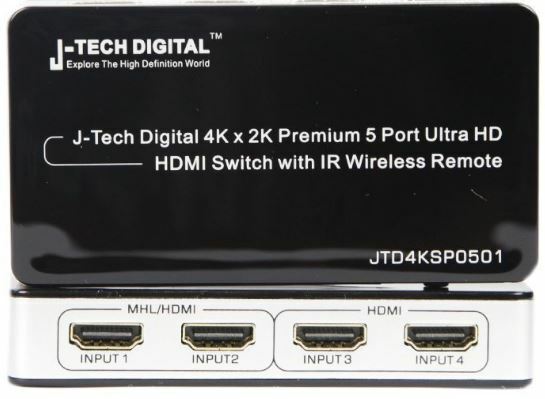 For most users, our recommendation would be for the J-Tech Digital HDMI Switch. It’s got some of the best compatibility on the market, and comes at a very affordable price. 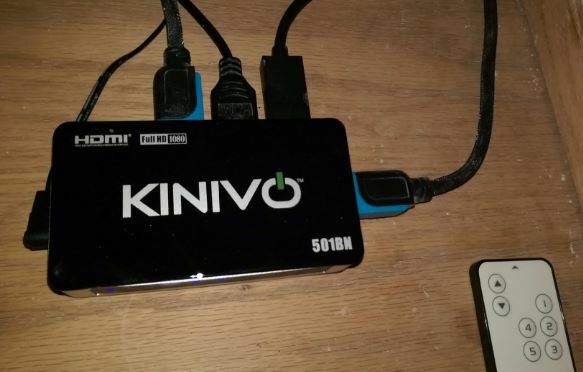 If you’re playing back 3D content and need five inputs, the Kinivo 501BN HDMI Switch is a great choice. It’s well made, and simple to use. Design conscious? There isn’t a switch on the market that is more attractive than the Zettaguard HDMI Switch. It might have less inputs than some, but most users will find that four inputs is plenty. Great information but I need a switch with audio out (RCAs). Is there one you can recommend? With it, I can watch PS4 pro, Xbox X and other HD sources at 4k quality on my UHD TV.